Who is the big, black bat? It could be you with this Tactical Batman Deluxe Adult Plus Costume. Includes a muscle chest jumpsuit with attached gauntlets and boot tops, removable cape, belt, and mask. This is an officially licensed Justice League costume. Batman is a real superhero with no supernatural powers. This Dark Knight doesn't require any alliance as he got will power to stop all criminals alone. Batman can hide his identity and frighten every dangerous criminal of Gotham city with his amazing Batsuit. Are you looking for extreme fun at your party? Then you have to get ready with your special costume. We are giving you some curated choices in party costumes . 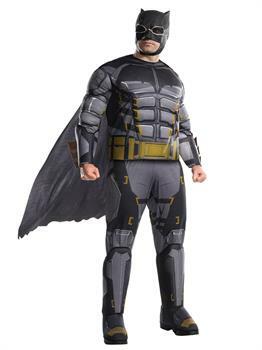 Show your creative mind with Justice League Movie - Tactical Batman Adult Plus costume.